You may already have heard (a lot) about mindfulness and how it has been incorporated into many fields and disciplines such as healthcare, psychology, holistic wellness, education, parenting, and even business and leadership, as well as corporate wellness. In the last three decades, there has been an exponential growth in the number of mindfulness publications, indicating a rising interest in the practice of mindfulness. But this does not mean that mindfulness is a fad; it has developed from a traditional Eastern practice into a well-researched, evidence-based healing approach that is practiced in a secular way and taught through a structured program. 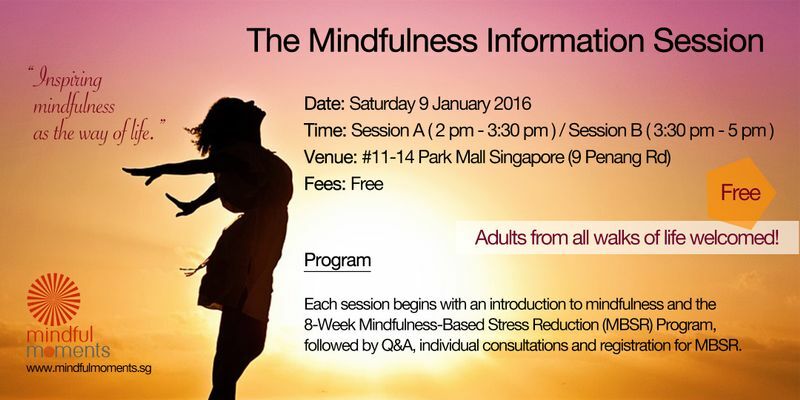 The Mindfulness Information Session is organized by Mindful Moments Singapore to spread awareness of mindfulness and inspire mindfulness as the way of life. This will be a chance for you to answer any burning questions you may have about mindfulness. The event is free and adults from all walks of life are welcomed to register and sit in. The talk will be conducted by Erin Lee, founder of Mindful Moments Singapore, Mindfulness Coach, Hypnotherapist and HypnoCoach® at Light On Life Singapore. Session A starts at 2 PM, and session B starts at 3:30 PM. Participants will only need to register for one of the sessions. For each session, Erin will begin with a talk about the background, development, applications and benefits of mindfulness as well as an introduction to the classic 8-Week Mindfulness-Based Stress Reduction (MBSR) Program. She will also bring participants through a short mindfulness practice as a group. Next, participants will be invited to ask questions about mindfulness and the MBSR program we offer. Last but not least, Erin will conduct individual consultations and intake for participants who are interested in registering for the March 2016 MBSR Program.